The past few years a battle has been taking place between the nation’s largest banks, regional banks and non-bank asset-based lenders (ABLs), all focused on $30-50 million ABL facilities. This competition has pitted the big banks vs. the regional banks and a new crop of non-bank ABLs that were formed to serve this market. At the same time, a new crop of non-bank ABL firms emerged to go after the $3-10 million ABL facilities. The result is that today’s market is hyper-efficient when it comes to larger ABL facilities where banks are truly giving away money for free in return for deposits, treasuries and facilities of less than $10 million that bigger banks can’t serve. The barriers to entry for sub-$10 million space are lower and competition for larger facilities is too crowded. This intense competition and over-crowding has created a void in the marketplace for $10-30 million facilities with a real focus on $10-20 million. 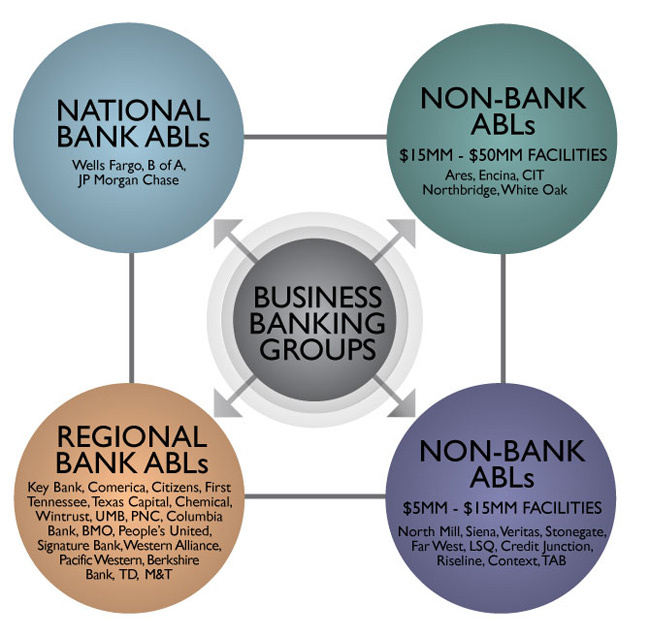 There are four constituencies headed on a collision course right now: big banks, regional banks, large non-bank ABLs and smaller non-bank ABLs–with the $10-20 million facility size being the concentric circle. These firms should each be put in distinct buckets. The “Big-Three” banks – Wells Fargo, JP Morgan Chase and Bank of America – have the scale, talent and capital to compete anywhere and anytime. The regional banks have the home-field advantage in their respective markets and deep-rooted relationships. On the non-bank side, the bigger and smaller non-bank ABL firms have rarely crossed paths until each of their spaces—sub-$10 million and greater-than $30 million—have become crowded and difficult, with the banks riding out a long bull market. The edict from Monday morning sales meetings across the country is simple—book assets at almost any cost. The economy is still great and regulation does not seem to be on the horizon, so make hay while the sun is out, as they say. The natural solution is for everyone to go after the inefficiency, which is becoming more and more apparent. The new competitive battlefield is really between $10 million and $20 million facilities. They are just big enough for the larger banks and non-bank ABLs to focus on, and still within reach of the smaller non-bank ABLs that want to separate themselves from their own competition. The “Big Three” banks, meanwhile, are trying to understand how to serve this space. They have invested in platforms, back-office technology and systems; and they currently have capacity—human and financial capital—due to competitive market conditions. Given this is the case, they are all strongly discussing how to serve this market—especially since they know the regional bank ABLs have been quite happy to book these assets. In a parallel universe, there are clear battle lines being drawn in the ABL market, which is getting smaller with the recent bank acquisitions of Marquette, Crestmark and AloStar, and will probably continue to shrink even more. This narrows the field of non-bank ABLs to a smaller number of independents. Ares, Encina and CIT Northbridge were each formed (or changed their strategies) to go up-market. Ares purchased First Capital for the human capital and platform and promptly directed themselves up-market, given less competitive market opportunity and the ability to take advantage of Ares’s balance sheet. Encina and CIT Northbridge were formed specifically to go after the larger non-bank ABL deals. These folks and a few others have proved formidable competition, which is why they have all been known to look down-market in their pursuit of growth. It just so happens their smaller independent competitors are all looking up-market as a way to differentiate themselves and to grow assets given it takes the same amount of work to book a $5 million facility as it does a $50 million facility. The sub-$10 million facility ABL competition is toughest because of the sheer number of players competing for the largest number of possible borrowers. Their average borrower borders on the cusp of transitioning from retail banking to business banking, and has real capital needs. It’s not only competitive, but it’s time consuming to manage and monitor collateral. This is just another reason why the $10-20 million space contains one the best market opportunities across the country. This space is the heart and soul of business banks for the national and regional powerhouses. These companies are typically privately held and are able to draw on the full resources of their banking platform. Each bank sells on platform and full-service offerings that are symbiotic. Banks have proven to be aggressive at keeping these clients. The convergence of all these competitors is most likely going to create an over-lending situation in both larger (greater than $30 million) and smaller (less than $10 million) facilities. What’s unique and interesting about this perfect storm of competition is that it is pitting four distinct constituencies against each other rather than a few. The business size to warrant a $10 million to $20 million facility is optimized to attract a lot of attention. This will surely create an over-competitive situation, with availability being stretched and prices sure to drop. Here at Super G, we have seen first-hand all the constituents mentioned above competing with each other. The market is ripe for competition. Smaller firms want the business and bigger firms can easily do a smaller deal. This area is going to be the next battle zone for market share, given the other areas have been fought over to create this white space in facility size. It should also be noted that some of this is defensive as we are all in a zero-sum game and the real constituents under attack are the business-banking groups throughout the country. In some ways this has caused the business-banking groups to be aggressive with credit as it’s clearly a borrowers’ market. The issue they face is that borrowers will trade lax monitoring for more availability in a true ABL structure. The ABLs across the country are all focused on the business-banking market. The commercial banks understand this competitive threat as it has dictated lax lending terms. This is clearly going to change, and borrowers are going to be heavily marketed to by all aforementioned constituents. So put your seatbelt on, because the intersection is going to get busy really fast.